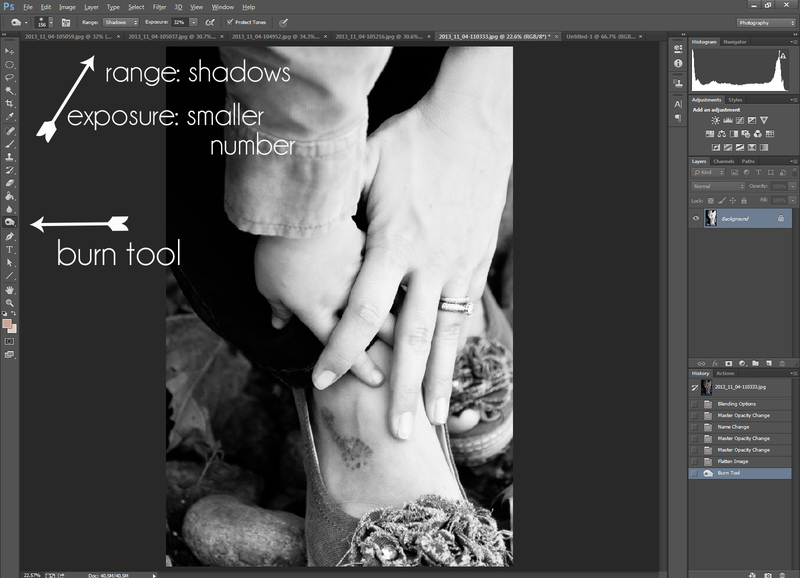 You can use these tips on your color photos, too, I just happen to have a black and white up in the example photos. I lease CS6 from Adobe and pay per year. It makes more financial sense for me right now than to pay for the whole package and then have to upgrade. This way, I get the latest version of whatever I want. But I’m sure the burn tool has similar settings in lots of formats. 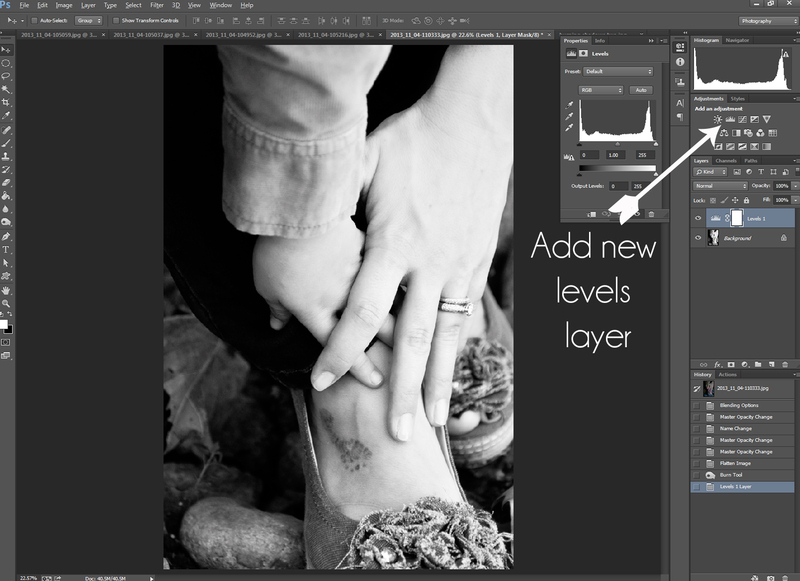 Trying to darken specific areas of your photo without the gray cloud? It’s just about changing a simple setting. 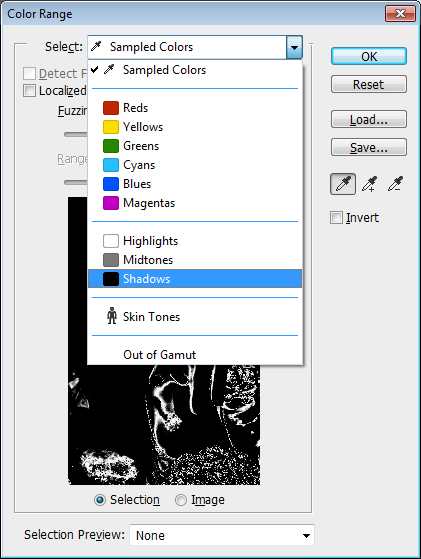 So, after you select the burn tool, go up to the tool menu at the top and change “range” from “midtones” to “shadows”. Then lower your exposure to around 30%, and try it out. It gives you a lot more control. 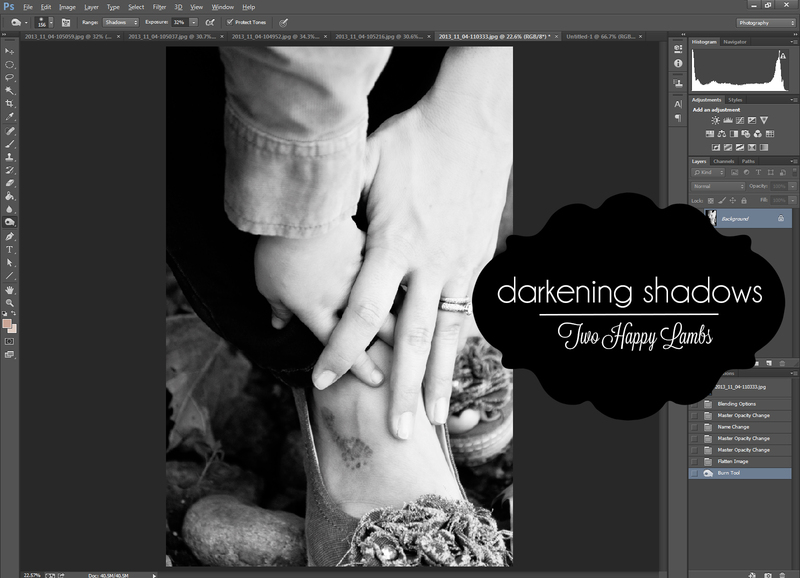 Basically I am just showing you how to make an action I call “Darken Shadows”. Once I am done color correcting and getting my midtones and highlights up to where I want them, I’ve got to make sure that I have some good true blacks to sharpen up my image. So, do a run through and see what your comfort zone is, and then record an action. Choose shadows, and it will select all the shadows! Brilliant. When you get back to the main screen, you can adjust the feathering when the mask is selected, and when the levels icon is selected, you can adjust how dark you make your shadows, by moving the little black arrow to the right. These adjustments are made in the properties window, in case it doesn’t pop open on it’s own. Have fun! Don’t forget to record an action!